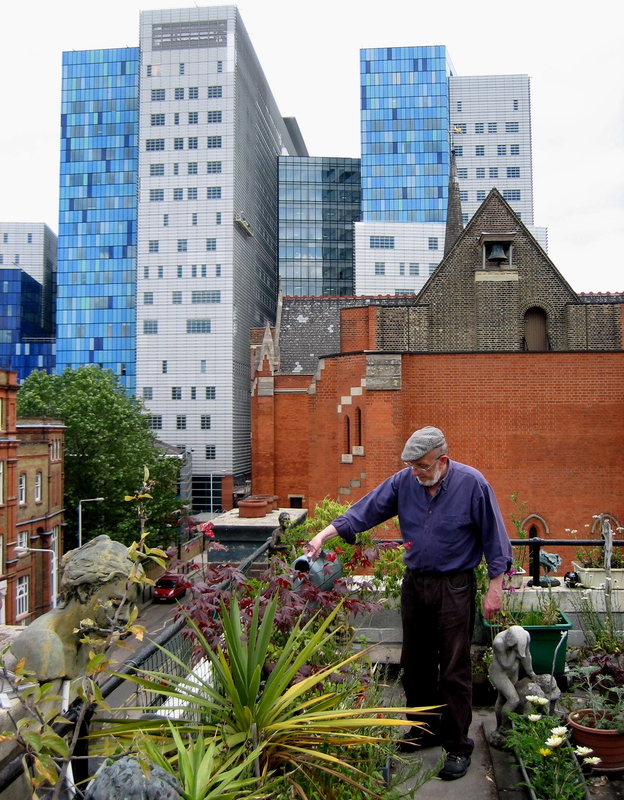 On a humid midsummer’s day in Whitechapel, the ideal place to be is up on the roof with Roy Emmins, in his wonderful sculpture garden at the back of the Royal London Hospital. Peering down upon everyone else, looking like ants going about their business with entirely mysterious imperatives, it is a refreshingly liberating experience, and if there is any breeze to be had, you feel its cooling influence up here, wafting the scents of Roy’s flowers over the rooftops. From this lofty roost, Roy can look back fondly to the hospital where for thirty-two years he worked as porter, surrounded today by the some of the sculptures that have occupied him full-time since he took early retirement from the hospital fifteen years ago. 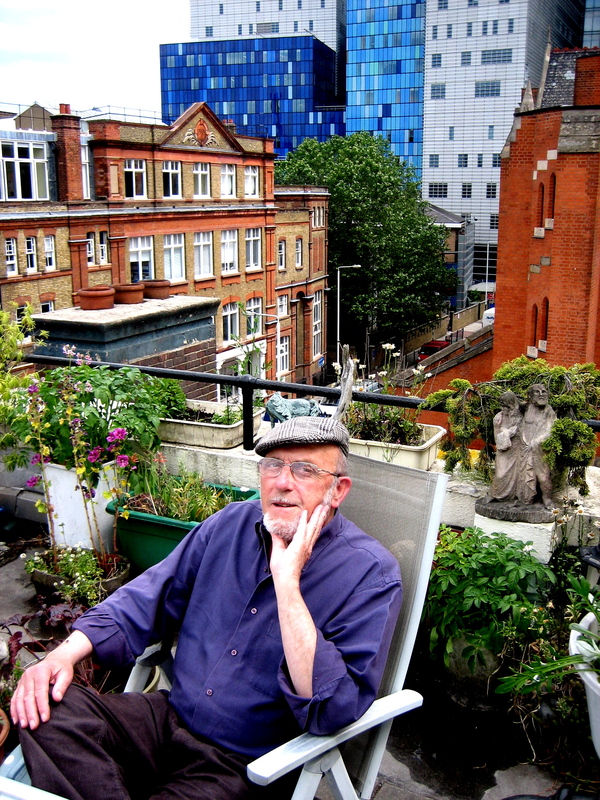 For the last thirty years, Roy has inhabited this tiny caretaker’s flat, added as an afterthought upon the roof of a streamlined art deco block in Turner St, and it was my pleasure to pay him a visit there. Roy took me up in the lift to the top floor, opened his blue front door and genially ushered me inside. To my delight, I found four small rooms organised meticulously, like cabins on a boat, with all kinds of shelves and cabinets where everything had its place, and every space was embellished with the great variety of Roy’s extraordinary sculptures and paintings, bestowing a magical presence of their own – from tiny birds shaped out of tinfoil to graceful human figures hewn from alabaster. Each narrow room has windows on either side, with views across the roofs and far over the city on both sides. On the South side is a bare roof covered in pigeons who conveniently leave fertilizer that Roy gratefully collects for his flourishing garden on the North side. Stocked from Columbia Road and Watney Markets, Roy’s roof garden possesses an intriguing selection of plants. Hardy varieties that withstand wind and thrive in dry conditions suit this location best, and I admired Roy’s inspired combinations of succulents, miniature trees and colourful border planting, like heucheras, artemisias, gazzanias, ox-eye daisies and mallow, mixed in with potatoes and three kinds of tomato plants. Yet it is the sculpture that make Roy’s garden pure poetry, his charismatic stone and concrete figures encrusted with lichen and bronze figures patinated green by the elements. At first, you do not spot all of them lurking among the plants, driftwood, shells and pots, but, as they catch your eye, you see the individual sculptures against the backdrop of the distant cityscape, proposing extraordinary contrasts of scale that fire the imagination. Roy’s earthly paradise is occasionally shattered when helicopters fly low overhead to land at the nearby helipad on the roof of the hospital. It gave our conversation some pauses for consideration, as we sipped our tea, waiting for the din of the whirring steel monster to pass over. However, the authorities at the hospital are conveniently moving the helipad shortly, away from Roy’s flat, up onto the top of the gleaming blue towers. The startling modernity of this new development exists in bizarre contrast to Roy’s first experience when he began working at the hospital in 1964 as a catering porter, and he remembers delivering milk to the matron’s flat in the eighteenth century West wing, with an old parlour retaining all of its nineteenth century furnishings including an aspidistra on a stand. To the East, directly across Turner St, is the deconsecrated church of St Augustine with St Philip, now used as the hospital library and archive, where the Elephant Man’s hat is kept, and Roy pointed out the bronze bell at our eye level, still hanging high upon the rooftop, where once he saw a kestrel perch to pull the feathers off a small bird and devour it for its dinner. To the West, gesturing in the opposite direction, Roy pointed out the former hostel in Fieldgate St that once counted Lenin and Orwell amongst its transient occupants. 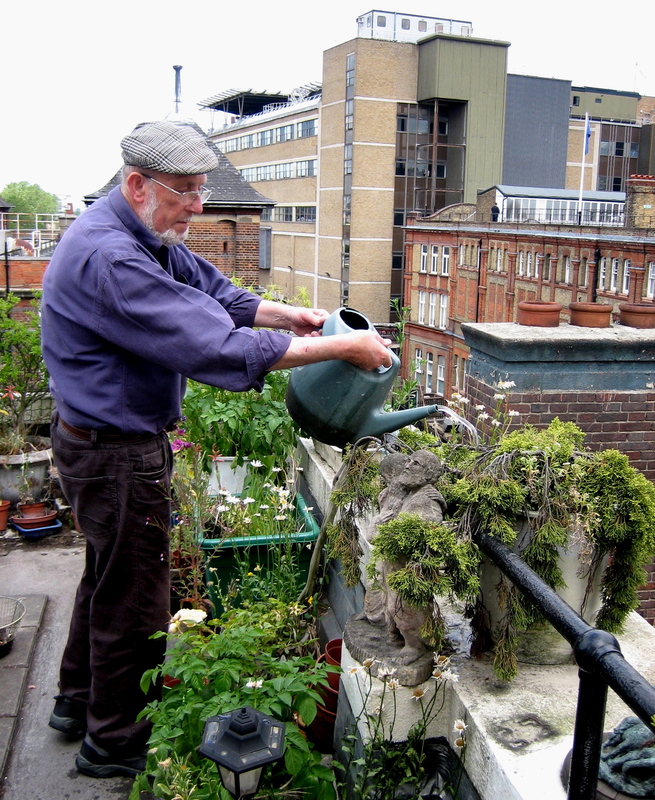 In this location, rich in every kind of cultural and historical resonance, Roy is alive to all the stories, which serve as a colourful background to the quiet home where he spends most of his time in his roof garden at this time of year. Two weeks ago, Roy acquired a new companion, Max, a short-haired black tomcat with a sturdy muscular body and a forthright personality. Previously living the life of a homeless alley cat, with battle scars and mange to prove it, under Roy’s benign influence Max already looks healthier. 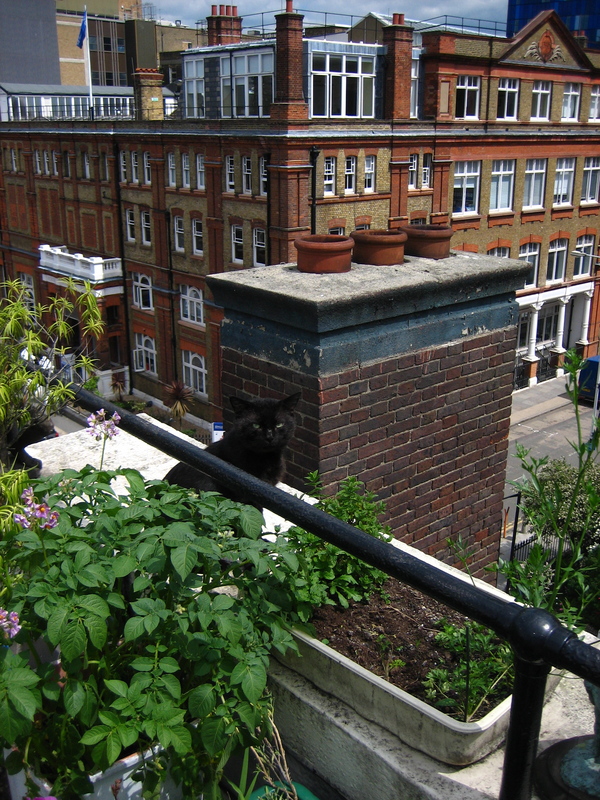 He has quickly made himself sublimely at home on Roy’s rooftop, even jumping with reckless innocence across the chasm onto the chimney stack of The Good Samaritan pub next door and sunning himself among the chimney pots. As Roy and I enjoyed our tea and idle conversation upon the roof top beneath the sunshine and slow-moving clouds, with astute opportunism Max took advantage of the companionable shade we created, stretching out beneath our seats. Moving between his rooftop flat and the studio down in Cable St, where he makes his sculptures, it is a modest yet enviable existence Roy has carved out for himself. As I said “Goodbye”, he handed me a bag with the noble paper mache lion that I bought from him, which now sits upon my desk as a constant reminder of Roy’s vision. I do not know if Roy Emmins’s placid spirit is the result of the life he has created for himself or whether his personality led him to seek out these calm spaces conducive to his sympathetic nature, so instead I must credit it all to the unique quality of his inventive imagination, creating such a prodigious range of work with constantly renewing delight. 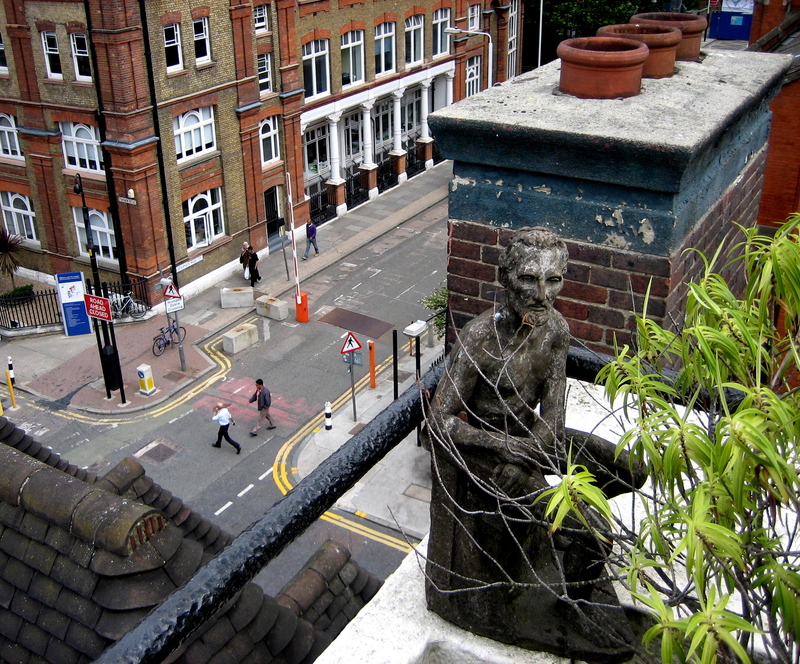 Max contemplates a death-defying leap onto the chimney stack of The Good Samaritan pub next door. 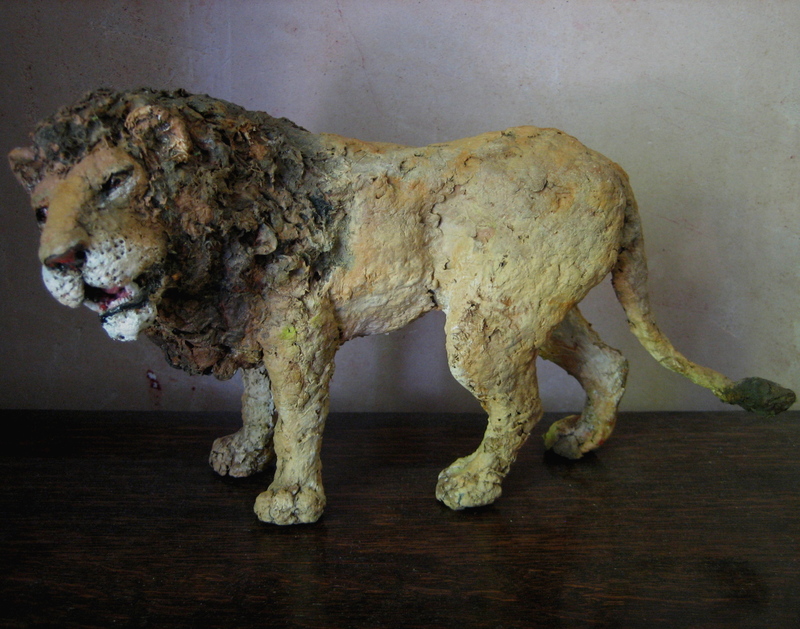 Roy Emmin’s paper mache lion. I live just up the road from Roy next to Spitalfields Market and am in the middle of trying to plan my own rooftop garden. Can I ask him a few questions if he is open to it? Specifically, I’d like to know about the general direction the wind typically comes from throughout the seasons; if there is indeed a predominant direction or instead all year-round perhaps it tends to come from the same direction? Also, I’d love to know his suggestions for the hardiest and easiest plants that thrive in his garden (as I’m quite new to gardening). Hi Roy, Things looking good including yourself. Best wishes Valerie and Michael. Hello Roy, Big thank you for sharing your beautiful Roof top views. into your flat. What a privilage to have. Adore the lion. Please lets see more.